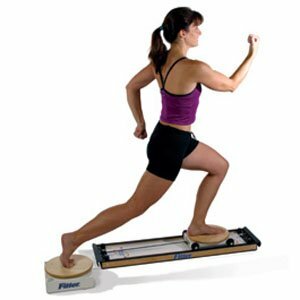 The SRF Board is an excellent tool for developing rotational stability in both the hip and shoulder joints, and can also provide a role in developing rotational stability in the spine, knees, ankles and elbows. Stabilization - Unique weight bearing exercises for upper and lower body applications. Rotational Discs - Discs allow dynamic movement patterns and provide a friction - free environment that encourages muscle development while decreasing torque at the knee. Functional Training - Training for all levels of clients from professional athletes to recent hip replacement patients. This versatile product allows you to do rehabilitation, general fitness cross-training and dance specific exercises. Resistance cords may be added from either end to assist or resist the forces of gravity on the user. Unlimited configurations with 2 piece system featuring 1 fixed and 1 sliding disc. Each disc features lock out pins to eliminate disc rotation for increased stability. Operates with resistance from 0 to 4 cords in either an assisted or resisted mode. If you have any questions about this product by Fitterfirst, contact us by completing and submitting the form below. If you are looking for a specif part number, please include it with your message.